Last fall, the third grade teacher team that I co-taught with was on a mission. We decided that we needed to do something about the frustrating fragments that often plagued our third graders' writing. Therefore, we started the school year by teaching the four types of sentences during writing time. Immediately after that, we tackled subjects & predicates. We wanted to provide meaningful experiences that would engage third grade students... a somewhat daunting goal at times when grammar is the task at hand. We sat there, puzzled, for several minutes. Slowly, my ideas started chugging. When brainstorming, I often try to come up with some sort of visual that students can apply to a new concept. Thinking while I spoke, I suggested that we try using a train analogy to teach subjects and predicates this year. We could teach students to think of a complete sentence as a train, with the subject being the train's engine, and the predicate serving as the train's caboose. 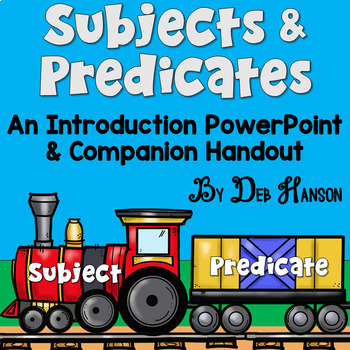 Then, in true Deb fashion, I started to envision a craftivity.... and then a PowerPoint... and then a page for their interactive notebooks... and within a matter of minutes, I had volunteered to create a series of train-themed subject and predicate materials. One of the things I loved about working with the third grade team at my school was that even when they didn't quite "see" the vision that I tried to explain to them, they always supported my elaborate visions and let me run with my ideas and create! This interactive PowerPoint contains 30 slides. After the introductory slides, students are given the opportunity to identify the subject and predicate within 15 practice sentences. 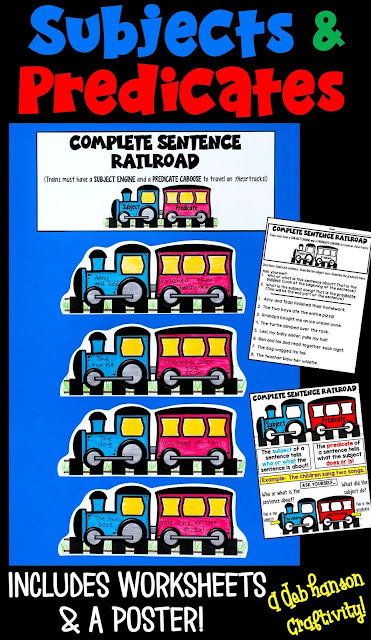 Not only did our third graders really seemed to enjoy the subject & predicate activities we did last year, I can honestly say that they really seemed to latch onto the train analogy! As teachers, we were very pleased with their progress following this unit. Best of all, it seemed to make a difference! Although we still had students who occasionally used fragments, these incomplete sentences didn't seem to plague the students' writing to the extent they had in years past. Furthermore, once we brought the fragment to their attention, students understood how to fix the problem almost immediately! I love this anchor chart - perfect for 3rd graders who absolutely need to work on writing/answering in complete sentences. I love the way you color coordinated the anchor chart and the matching craftivity. Wow very nice and informative post about Subject and Predicate. I needed some clarification. Thank you.